Since 1984, I have been exploring, excavating and presenting the archaeological record of Bible Lands. My mission is to explore the meeting place of the biblical text and its context. Common sense dictates that any text must first be read on its own terms, in its own time and place, and against the backdrop its own environment. Other readings may be helpful, but are secondary. Contexts, therefore, are many and diverse, and may be defined by pursuits that are linguistic, literary, historical, social, and theological, to name a few. I dabble in all of the above. I teach because teaching allows me to fulfill the fundamental responsibility of ministry: making and maturing disciples. This responsibility is discharged through the balance of faith and action, through reading, reflecting on, and appropriating the experiences of others, through the development of healthy relationships, and the choice to be an agent of positive change, regardless of situation or position. I want to radiate these priorities. I travel for more selfish reasons. Possessions, comforts, food, habits, and a hundred other things dull my senses. Travel has an astringent quality. It scrapes off the barnacles and opens me up to new ideas, greater self-awareness, the fragility of the environment, and a fresh compassion for those around me. I feel alive when I move lightly over foreign ground. 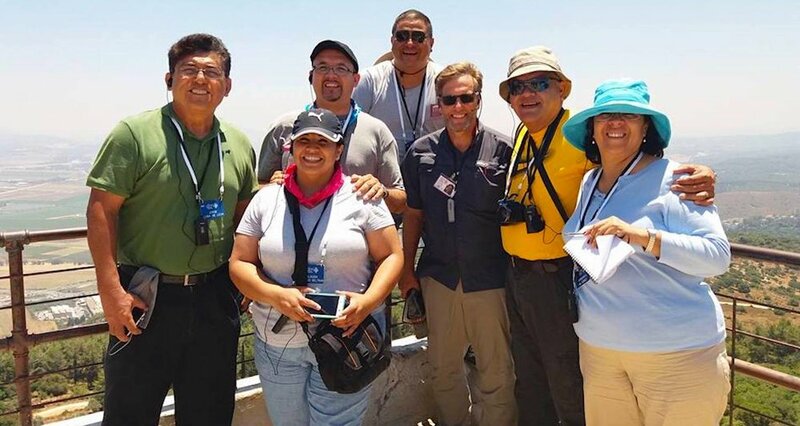 Visiting Mt Carmel with Professors Octavio Ruiz, Daniel Llamas and friends from Collegio Biblico, Piedras Negras, Mexico. I organize trips to combine these loves. Group travel, of course, is not the same as solo travel. Both have advantages and disadvantages. I enjoy the challenge of working with groups in cross-cultural situations. This requires the clear communication of priorities, the careful management of itinerary, instruction in low-impact strategies of engagement, voiced awareness of human rights issues and democratic initiatives, and the redirection of traveler spending to smaller markets that support the local economy. My work takes place on the campus of Johnson University on a daily basis. Here, as Dean of the School of Bible and Theology, I work with students and faculty, drink coffee, and teach classes. During the school year I am often available for speaking engagements in the evenings or on the weekends. Through much of the summer I travel. I write, hike, climb, sail, and scuba dive whenever I can. My experience in the archaeological field has been gained primarily in the regions of Israel-Palestine and Jordan. Sites include Khirbet Nisya (Palestine), the Abila Excavations (Jordan), Tel Dan (Israel), Tell Jawa (Jordan), the Madaba Plains Project (Jordan), and the Khirbet Birzeit Excavations (Palestine). Roles assumed in two decades of work in these places iclude wheelbarrow-man, square supervisor, assistant field supervisor, field supervisor, photography director, architect/surveyor, educational director, and assistant director. Serious archaeology at Tell Jalul, Jordan (2006).